When I was growing up in a small country village in the Southeast of England, I was determined I would wander the world, live and work in busy and exciting cities and try my hand at different things - and I was lucky, because I did. But I never imagined I would be an Innkeeper and have a home in Vermont - in fact, I hardly knew where it was on the map. Scott is a software developer from the suburbs of Boston, and I don't think he ever imagined he would be an Innkeeper either. But unlike me he knew Vermont from way back - he even lived here for a while. Later on, when we lived in Manhattan, he used to bring me to Vermont for long weekend escapes. We even got married here, in a tiny little village way up in the Northeast Kingdom - and on another of those visits, we found Deerhill Inn. It took a number of years before we decided on Innkeeping as our next adventure, and settled on Deerhill Inn as our destination. But from the first we loved its quiet serenity, its gorgeous views and lovely grounds, and the sense of history and continuity that is one of Vermont's particular gifts. Beyond that, though, there seems to us to be something unique and valuable about the Inn, the Valley and the Mountains which we want to preserve and share. We often get asked whether we mind having guests all the time in our own home, but actually we love it. We meet so many interesting people and it's such a pleasure to see them gradually unwind from their stressful lives, settle into the Inn and truly relax - then start to look around at all the fun and interesting things this part of Southern Vermont has to offer. Of course, life would be no fun at all without our wonderful staff, and we know how lucky we are to have found people who share our commitment to caring for our guests as we would like to be looked after ourselves. Our Head Housekeeper Monika and her husband Tyler lead our housekeeping team - when they are not working for us, they are bringing up their little boy Logan - and they take a very personal pride in keeping the Inn spotless and perfect in every way. Happily, our Executive Chef Ryan O'Connor shares our vision of presenting locally-sourced food prepared with respect and restraint, allowing the wonderful fresh flavors to speak for themselves. And he has the talent to produce the innovative but accessible cuisine our dining guests so much enjoy. The last word, though, belongs to Sophie who joined our small family around five years ago just before we came to the Inn. 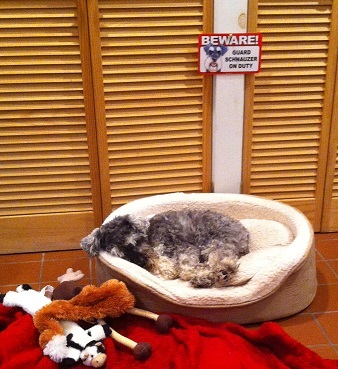 Sophie is hypoallergenic and a gentle soul - she's the only Miniature Schnauzer on the planet who never barks and never jumps - and she greets every guest as soon as they come through the Inn doorway with a friendly foot-snuffle. Sophie Says: please come visit us at Deerhill Inn. Curl up, snuggle in and relax. And when it's time for breakfast, come down to the Dining Room and smell the bacon! For stays of two nights or more we require a deposit of 50% of your total Lodging Charges, together with applicable taxes, at the time of booking. The balance is not payable until you leave us. For one night stays your total Lodging Charges are payable at the time of booking, together with taxes. Up to 21 days from your arrival date we will refund your deposit less a $30 per room cancellation fee. Between 21 days and 72 hours of your arrival date your deposit is not refundable, but you may reuse your deposit towards a stay within twelve months of your cancelled arrival date, subject to availability. If you cancel your rescheduled visit at any time your deposit is not refundable. Within 72 hours of noon on your arrival date you are responsible for full payment of lodging charges and any non-refundable extras for the entire reserved stay. This includes cancellations or changes to your booking for any reason including weather, "no shows", late arrivals and/or early departures. We will do our best to accommodate changes to your booking dates up to 72 hours before noon on your arrival date, subject to availability and at our discretion. After that time, or if we cannot reschedule your stay, our Cancellation Policy will apply. Up to fourteen (14) days before the date of your arrival, all Extras and Package components can be cancelled without penalty. However, within fourteen days of the date of your arival, any Ski Lift Tickets and Greens Fees, whether booked as an Extra or as part of a Package, cannot be cancelled and must be paid for in full. Two-night minimum stays are normally required for weekends and some Holidays. We do vary this Policy under certain circumstances -- contact us to check availability. Vermont State and Dover Town taxes total 10% on rooms and meals, and 11% on alcoholic beverages. Sales Tax on other items totals 7%. We welcome all major credit and debit cards including American Express, Visa, MasterCard and Discover cards. In addition to the specific amenities listed in our Room Descriptions, all our guest rooms are equipped with microfiber robes, CD player/alarm clocks, complimentary L'Occitane toiletries, Vermont Pure water and our home-made cookies. Full cooked country breakfast for two and afternoon refreshment, each day of your stay, is included in your Lodging Charge. We do not add a service charge to your bill. If you would like to recognize their service by offering a gratuity to our breakfast or dinner Waitstaff, and/or leave something for our Housekeepers, they do always appreciate this kindness. You will find information on how to do this in our Restaurant and in your guest room, and we are always happy to help. We welcome children over twelve years old however the Inn is not suitable for younger children. We do not have cribs, high chairs or a children's menu. We are sorry, but we cannot accept guest pets at the Inn: even with deep-cleaning of guest rooms this may cause problems for other guests. Our own dog Sophie lives at the Inn. Sophie is a small dog with hypoallergenic hair not fur. She is mellow and gentle and never barks. Sophie is not allowed in the guest rooms. We do of course welcome Service Animals -- view our Deerhill Inn Service Animal Policy. From 3:00 pm on your arrival date. With advance notice, we may be able to offer a slightly earlier check-in -- please let us know as soon as possible. By 11:00 am on your departure date. Please give us as much notice as possible if you would prefer to check-out a little later, and we will accommodate you if we can. We do not allow smoking anywhere inside the Inn. Guests may smoke in the porches and grounds provided no other guests are inconvenienced. If we need to deep clean your room due to smoking an extra charge will apply. There are no refrigerators in the guest rooms, but there is a small shared refrigerator for the use of guests in the Inn. If you need to refrigerate anything larger, we are happy to store items in one of our Kitchen refrigerators. Guests are welcome to help themselves at any time to ice from our Ice Machine. There are hairdryers in all our guest rooms. There are irons and ironing boards in all our guest rooms. Yes, we have electric vehicle charging stations! In the main parking lot we have a 50-amp Tesla charger and a 40-amp ClipperCreek universal charger. These charging stations are available to lodging and dining guests. Please let us know if you require a charging station for your vehicle and we will endeavor to ensure that it is available for your use during your stay with us. A convenient drive from New York City, Albany, Hartford or Boston, Deerhill Inn is perfectly situated for a weekend or a well-deserved holiday. We are located within one mile of the Mount Snow Airport and would be happy to make pick-up arrangements for guests arriving by private plane. For guests with GPS systems - our exact address is 14 Valley View Rd. We are located in the village of West Dover -- through the small historic village, past the Town Office, the Church and the West Dover Inn. When coming from the South, turn right onto Valley View Road, just before the Deerfield Valley Inn (approximately 6 miles north of the stop light in Wilmington). 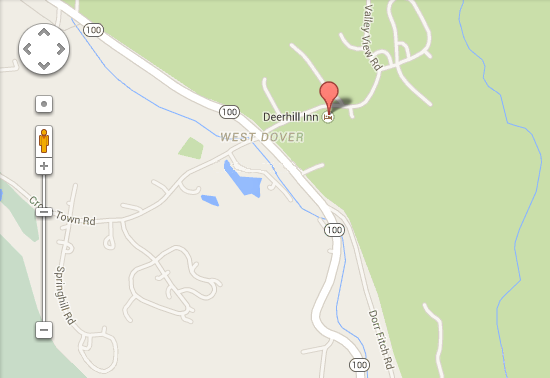 NOTE: The Deerfield Valley Inn, which is the red Inn on the corner, is not our Inn! Valley View Road is the right turn just before this Inn. The road signage is poor, and you may not see the sign until you turn. As you come up Valley View Road, you will see our Inn on the right side of the road facing out towards the Green Mountains. Guests are always welcome to drive up to the front of the Inn (the second entrance as you go up Valley View Road) to check in and unload luggage. I-91 North to second exit in Brattleboro, VT.
Route 9 West to Wilmington. Right on VT Route 100 North to West Dover. Right onto Valley View Road and up the hill just one tenth of a mile. Route 2 to I-91 North to second exit in Brattleboro, VT.
NY Route 7 East to VT Route 9. Through Bennington, VT to Wilmington, VT.
Left on VT Route 100 North to West Dover.